Photokina 2018 is nearly here, and we’re very excited about bringing you the latest news from the world’s greatest photography exhibition. We know about some of the new products we’re going to see already, and we’ve heard rumours about some more, but Photokina always springs surprises and we don’t expect this year to be any different. Based on what we know, or think we know already, though, here’s our top five things to get excited about for Photokina 2018. Press day is Tuesday September 25th and Panasonic will be holding a big press conference in the early afternoon. What it’s revealing is shrouded in mystery. We have a few ideas and we’ve read the same rumours as everyone else, so we hope it’s a full-frame mirrorless camera, and we hear whispers of a Leica and Sigma tie-in, but we don’t have long to wait to find out for sure. And if it’s not what we think (boo!) there’s always the Fujifilm press conference an hour later, where we may or may not hear about a new and affordable medium format model to join the GFX 50S… rumored to be called the GFX 50R. Elsewhere, we’ve already reviewed the new Nikon Z7, but we haven’t tried out the cheaper Z6 yet, and this could be the really big seller. We’ve also booked a visit to the Canon stand to get our hands on the brand new EOS R – that’s always assuming we can batter our way through the queues. Chinese lens maker Laowa has just announced no fewer than eight new lenses due to make their debut at Photokina. Laowa’s speciality so far has been macro lenses and ultra-wide-angle primes, but it also makes the widest zoom you can currently get for full frame Sony mirrorless cameras, it’s really boosting its support for the Micro Four Thirds format and it’s even dabbling with cine lenses, with a new 25-100mm f/2.9 optic and reworked video versions of many of its existing lenses. And Irix are launching their third prime lens – a very interesting looking 150mm f/2.8 Macro. We also want to see what Sigma’s got up its sleeve - rumored to be a Sports version of its 70-200mm, and an all-new 60-600mm supertelephoto superzoom. We also want to discover what’s new from Tamron, Zeiss, Samyang and a whole bunch of other lens makers. The lens market is really interesting right now, as independent makers like these are now rivalling or beating own-brand lenses for image quality and coming up with optical designs and ideas we just don’t see from the camera makers. Video is big business now, and it covers a huge spectrum of users. You’ve got the professional cinematographers at the top end, professional stills photographers moving into video in the middle and smartphone lifeloggers and journalists learning to shoot in a fast, naturalistic kind of way at the other. This is a rapidly developing market, and we expect to see some innovative products right across this spectrum. 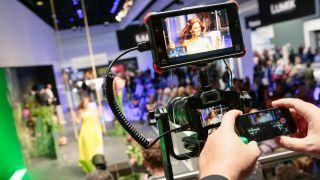 We'll definitely swing by the RED stand to see its stupefying 60fps 8K Monstro (which there’s no way we can afford) and scour the show for some handy gimbal, light, and microphone attachments for smartphones (which we can). It’s not all about Photoshop. There are some very interesting software tools out there that go places and do things way outside the usual Adobe ecosphere. Phase One’s new IQ4 camera system moves much the raw processing overhead from your computer into the camera itself, which is interesting, Fujifilm’s X Raw Studio does the same. We’ve no idea how these work so now’s our chance to get a walkthrough. Skylum, meanwhile, will be demonstrating its new DAM (digital asset management) system to go with its rather clever Luminar photo editor, so we hope to get a look at that too. So you don’t see many bags or tripods on rumour sites because they don’t quite capture the imagination, right? But we all need them, and if you’re a bit of a tripod nerd (oh yeah!) you can spend hours fiddling with friction dampers, ball sockets and pan axes. We know Manfrotto has some secret new things to show us, we can drool over some utterly unaffordable Gitzos and we expect to find a whole bunch of other neat camera supports lurking in the Photokina labyrinth. And the thing about seeing camera bags at a show is that this is about the only chance you’ll get to compare a whole bunch of them in the flesh. All those weeks of indecision will vanish the moment you get your hands on a Billingham ClogBall (yes, that is a thing) or a Peak Design Capture Clip.